A rectangular area of a Material that responds to touch. For a variant of this widget that does not clip splashes, see InkResponse. The following diagram shows how an InkWell looks when tapped, when using default values. The InkWell widget must have a Material widget as an ancestor. The Material widget is where the ink reactions are actually painted. This matches the material design premise wherein the Material is what is actually reacting to touches by spreading ink. The ink splashes aren't visible! If there is an opaque graphic, e.g. 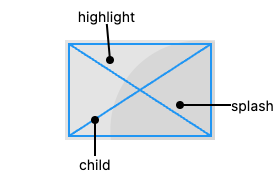 painted using a Container, Image, or DecoratedBox, between the Material widget and the InkWell widget, then the splash won't be visible because it will be under the opaque graphic. This is because ink splashes draw on the underlying Material itself, as if the ink was spreading inside the material. The Ink widget can be used as a replacement for Image, Container, or DecoratedBox to ensure that the image or decoration also paints in the Material itself, below the ink. If this is not possible for some reason, e.g. because you are using an opaque CustomPaint widget, alternatively consider using a second Material above the opaque widget but below the InkWell (as an ancestor to the ink well). The MaterialType.transparency material kind can be used for this purpose. GestureDetector, for listening for gestures without ink splashes. RaisedButton and FlatButton, two kinds of buttons in material design. InkResponse, a variant of InkWell that doesn't force a rectangular shape on the ink reaction.